The Idaho Cutting Horse Association is offering it’s 1st Annual Rodear Competition. September 2nd at the Idaho Horse Park. It will consist of 1 go and a finals. The word rodear is a Spanish word meaning to circle something. The high desert cowboys of Nevada and California call it rodearing the cattle when they gather them out on the range and work them. In that kind of country it can be a long way to the corral. If they want to brand, wean calves, or anything else. They just rodear the cattle where ever they are usually in a fence corner or at least along a fence or cut bank. With enough help they can just circle them up out in the open. Some have learned to use dogs to hole the rodear and get by with a lot less people. Accomplished dog handlers can actually use their dog to come into the herd with them and push a cow out to the cut heard and hold the cut as well. Like cutting and many rodeo events that were born out of real ranch work. Rodear has become a competition to display the skills of the cowboy, his dog and horse. A rodear competition usually starts with a sort as apposed to the traditional cow or sheepdog our run. The contestant with his dog, will ride into a herd of cattle in a sort pen and cut out 3 or 5 head of cattle. They will then bring the cattle out into the open arena or field and put them through a series of obstacles designed to test the skills of the dog and his cowboy or cowgirl. It is what we call a point and time event the contestant will earn points for each cow that passes through an obstacle. The one with the highest accumulation of points within the time limit will win. If 2 or more people complete the course within the allotted time the fastest time will break the tie. 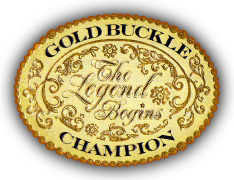 Previous Post Let The Good Times Roll Next Post Gold Buckle Champions Reaches Internationally!